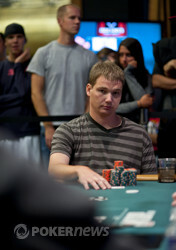 Brent Hanks is the champion of event 2 of the 2012 WSOP. The poker purists couldn't have dreamed for a better final table for our first top tier WSOP bracelet event of 2012. WSOP bracelet holders Vanessa Selbst, JP Kelly and Andrew Badecker all making sure that our lips remained moist by securing their berths. But after the cards had stopped flying and the chips stopped riffling it was only fitting that Brent Hanks was the man who had to find a security box for his new piece of gold. Hanks has made three previous WSOP final tables, but until today his pan always remained devoid of gold, so our congratulations are with him in his moment of glory. If you were wondering how to squeeze 2,101 players into three days of poker then Event #2 $1,500 No-Limit Hold'em had all of the secret ingredients. We started Day 3 with 15-players but were down to the final table of 9 within the blink of an eye, and it was all of the inexperienced players who fell by the wayside. When the final table started all eyes were on the WSOP gold bracelets owners and it was JP Kelly who had the roughest ride of the three. The infamous British rail was back and they hollered and cheered irrespective of whether JP Kelly won or lost! JP Kelly doubled up Abdyl Konjuhi, cracked the aces of Andrew Badecker, was crippled my Michael Kaufman, quadrupled up and then finally left the building after being eliminated by Brent Hanks in 8th place. Vanessa Selbst was searching for her second bracelet and after eliminating Michael Kaufman in 7th place she became the chip leader. No sooner did everyone think Selbst would go on her usual dominating march, Brent Hanks pulled her back after a blind battle where Hanks hit a full house at the same time that Selbst hit a straight. Not only did Selbst slip from the top spot but also it was a tournament defining hand for Hanks. Heading into Level 26 and it was Hanks, Selbst and Bazeley who each had over 2 million in chips. Hanks and Selbst were very active but Bazeley seemed somewhat card dead. 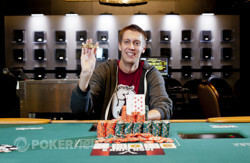 Brent Hanks then became the first player to reach 3 million chips when he eliminated Abdyl Konjuhi in 6th place, Bazeley found a hand and reduced Selbst to the short stack and Andrew Badecker stepped up to the plate with the eliminations of Ryan Schmidt in 5th place the dangerous Vanessa Selbst in 4th place. So into three-handed play it was Badecker with all the chips, all the momentum and all the experience of finishing off WSOP final tables. But who cares if you river a boat against an opponent holding a higher boat! Jacob Bazeley holding on a board of against the of Badecker. The dust had still not settled on that hand when Badecker was out in 3rd place. He got it all-in holding and Hanks woke up with to set up the heads-up battle. It was even-steven going into heads-up and for several hours of heads-up action there was still no separating them. It was always going to come down to one monumental all-in pre flop encounter and when it happened Bazeley was the favourite to take home the WSOP gold. Brent Hanks raised to 160,000, Jacob Bazeley three-bet to 420,000, Brent Hanks four-bet to 780,000, Jacob Bazeley five bet jammed all-in and Brent Hanks made the call. It was Bazeley and his versus Hanks and his . Bazeley was just five cards away from his dream title but the deck had a different destiny in mind. The on the flop handing Hanks the winning hand but he would have to wait a little bit longer for his moment of glory as Bazeley was left with some chip dust. The inevitable ending happened in the very next hand when the of Hanks beat the of Bazeley and Hanks was crowned Event #2 $1,500 No-Limit Hold'em champion! After making the trek to three WSOP final tables, and coming away empty handed each time, has Brent Hanks finally solved his WSOP final table riddle? After what had been a very pedestrian paced heads-up encounter it sparked into life in one magical moment of pre flop tension. Brent Hanks raised to 160,000, Jacob Bazeley three-bet to 420,000, Brent Hanks four-bet to 780,000, Jacob Bazeley five bet jammed all-in and Brent Hanks made the call. Bazeley was ahead and he had Hanks covered. The dealer was preparing to reveal the board and the chants were raining down from the rail, "ace, ace, ace, ace, ace, ace!" There was a huge cheer from the rail as the sight of the ace penetrated the eyeballs. The turn and river could not save Bazeley and he was down to less than one big blind. In the very next hand the cards were turned over and Hanks was just five cards away from WSOP glory, after his were shown to dominate the of Bazeley. The board ran out and Hanks had won his first WSOP bracelet despite being down to as low as two big blinds early on during Day 2. Commiserations to Jacob Bazeley who takes away $322,294 for his runner-up finish. Jacob Bazeley raised to 120,000 and Brent Hanks made the call. The flop looked like this - - and it was Bazeley first into the pot with a 120,000 bet. Hanks made the call, the dealer showed them the on the turn and both players checked. The river was the , Hanks checked, Bazeley bet 300,000 and Hanks surrendered his hand. Jacob Bazeley raised to 120,000 and Brent Hanks three-bet to 300,000. Bazeley made the call and the flop came down . Hanks lead out for 415,000 and Bazeley called. The turn was the and Hanks checked to Bazeley who bet 600,000. Hanks announced he was all-in and Bazeley folded his cards right away. Hanks is now well out in front but we are still really deep. Jacob Bazeley raised to 120,000 and Brent Hanks made the call. The flop was , Hanks checked, Bazeley bet 125,000 and Hanks made the call. Onto the turn and both players checked before we saw the on the river. Both players checked and Bazeley won the hand with . Brent Hanks raised to 120,000 from the button and Bazeley three-bet to 340,000. Hanks tanked for a bit and called. The flop came down and Bazeley bet 280,000, Hanks followed with the call. The turn was the and both players checked. On the river the popped up and Bazeley bet 550,000. Hanks went into the tank again and after a good minute he folded. Jacob Bazeley raised to 120,000 from the button and Brent Hanks made the call from the big blind. The flop came down and Hanks checked to Bazeley who bet 125,000. Hanks put out a re-raise to 315,000 and took down the pot. 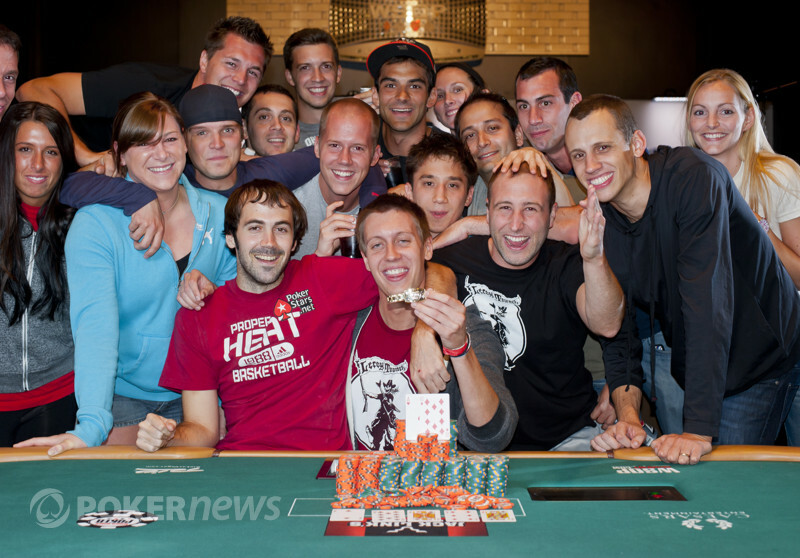 Brent Hanks,champion of event 2 of the 2012 WSOP, celebrates with friends.